This book shows that there is more than one side to a story and would be useful to discuss in a classroom. It’s one of the nominees for this year’s Blue Spruce Award from the Ontario Library Association. 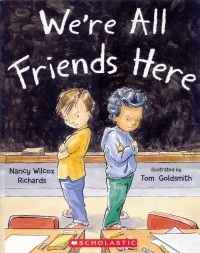 We’re All Friends Here, written by Nancy Wilcox Richards and illustrated by Tom Goldsmith was published by Scholastic Canada in 2014. Such an interesting story structure! It’s told by two different main characters in first person. First it starts with Sonny’s side of things, then we get Arthur’s perspective. The ending is told on two spreads, one from each character. I’ve never seen a picture book told in this way before. I’d be interested in reading it with students to see if they understand what is happening or need help from an adult. I liked the way the illustrator included a lined paper drawing that looked like it was drawn by the character to start their section of the story. The realistic illustrations help to clarify which student is telling each part of the story. This story would be useful for teaching about different perspectives and how, while everyone has their own point of view, one isn’t better or worse than the other. It would be good for starting discussions about listening to and thinking about other points of view. Do Arthur and Sonny like each other? Explain. Try comparing perspectives on the same event (e.g., going to an assembly, what happened a recess) with a partner, either by writing a paragraph or acting it out. Another character, Debbie, is mentioned in the story. Write or draw a comic showing what things are like from her point of view. I enjoyed reading this book – it gave me a lot to think about! Lily loves her half-brother, Adam, but she has always struggled with him, too. He's definitely on the autism spectrum — though her step-father, Don, can barely bring himself to admit it — and caring for him has forced Lily to become as much mother as sister. All Lily wants is for her step-father to acknowledge that Adam has a real issue, that they need to find some kind of program that can help him. Then maybe she can have a life of her own. Adam's always loved dolphins, so when Don, an oncologist, hears about a young dolphin with cancer, he offers to help. He brings Lily and Adam along, and Adam and the dolphin, Nori, bond instantly. But though Lily sees how much Adam loves Nori, she also sees that the dolphin shouldn't spend the rest of her life in captivity, away from her family. Can Adam find real help somewhere else? And can Lily help Nori regain her freedom without betraying her family? 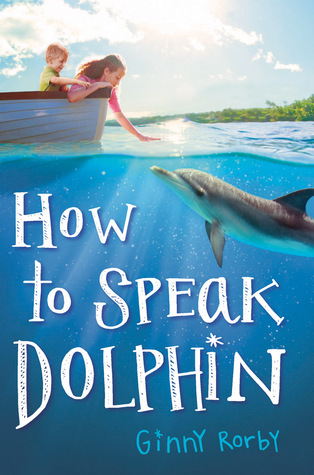 How to Speak Dolphin was written by Ginny Rorby and published by Scholastic in 2015. What I liked most about this book is that the characters were all individual, portrayed with flaws and struggles, and opinions about issues such as animal rights. Lily has an autistic brother and has made friends with Zoe, who is blind and very concerned about animal rights. There was a lot to think about while reading this book – especially about how to respect others and appreciate what’s special about them inside. It also made me think about the rights of animals and how we treat them. The family situation in this story was portrayed in realistic way. Lily and Adam’s main caregiver was a step-father, and he was struggling with the challenges of an autistic child as well as what had happened to his family. It was so nice that the parent wasn’t portrayed as perfect or always understanding but as a person with weaknesses, feelings and opinions, even if I didn’t always agree with them. For writers, this is a good book to study if you are writing a story with many different threads and lots of emotional weight. There are some sections from the dolphin’s perspective, too. 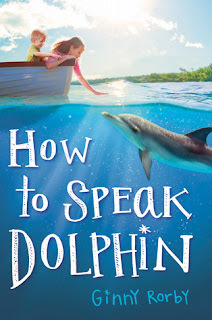 After reading this book, I’d like to find some of Ginny Rorby’s other novels, which include HURT GO HAPPY (about a deaf girl and a chimpanzee that is learning to sign), LOST IN THE RIVER OF GRASS (a young adult survival story in the Everglades) and THE OUTSIDE OF A HORSE (about a girl working with rescue horses whose father has PTSD after returning from the war in Iraq). I am especially fond of stories about elephants and this one is a lot of fun! Sadie is on her way to deliver an elephant to her Great-Aunt Josephine, who lives completely alone and can really use the company. She tries everything from mailing the elephant to boarding a plane, a train, and an alligator to get to her aunt's home. Along the way she meets an array of interesting characters, including an odd postal worker and a gang of bandit monkeys, who all help her get where she is going. 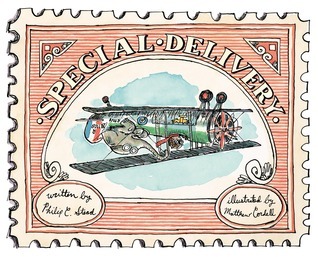 Special Delivery, written by Philip C. Stead and illustrated by Matthew Cordell was published by Roaring Brook Press in 2015. Although I predicted the ending, the journey to get there was a lot of fun. I really liked the way the author told the story completely in dialogue (and a few signs). This story also includes a wonderful example of effectively using a repeated line of text. The illustrations are delightful, especially if you look closely at the expressions of the elephant and the clever details on each page. It was interesting that Sadie’s interactions with people in the story were all outside (outdoor post office) which made me think of Sadie’s story on another level as part of her imaginative play at a family gathering. This story would be a lot of fun to read with young students! As a kindergarten teacher, I would probably plan to read it just for fun when setting up a class post office (even though snail mail seems to be disappearing). It would also be a good example for talking about story structure with a problem and solution. Or a good example for encouraging students to make up their own "tall tales." Choose your favorite animal. Draw a picture to show an imaginative way to deliver your animal to Great-Aunt Josephine. Act out the story, making up actions to show the different kinds of transportation Sadie used to get to Great-Aunt Josephine’s. Play a group memory game: Sit in a circle. Pass around a bean bag or ball. Students repeat the line: On Sadie's trip to visit her aunt, she traveled by _______, adding a new method of transportation each time. See how many you can remember! I wasn’t sure I would like this Gordon Korman story, but I really enjoyed the mystery, as well as the adventure of trying to figure out why the main characters were special. 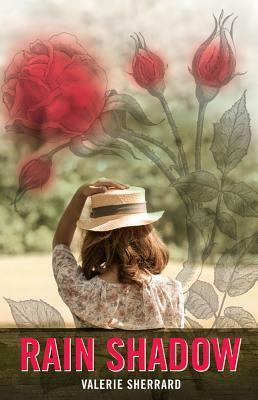 This is another book from the short list for the 2016 Silver Birch Fiction Awards from the Ontario Library Association. 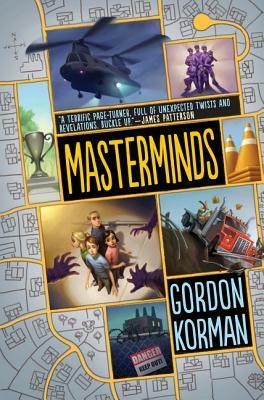 Masterminds was written by Gordon Korman and published by HarperCollins in 2015. The concept behind this book intriguing and makes for a fun and exciting adventure. I got hooked on the mystery of what was different and special about this group of kids and my curiosity kept me reading. One of the challenges of reading this book for me was all the different characters and perspectives. At times, I had to check the chapter heading to remind myself which character’s perspective I was reading. But mostly, I was just wanting to see what would happen next! A writer could learn about keeping the story moving and building a mystery from reading this book. For me, the most interesting thing about it is the uniqueness of the concept, and how he built a compelling story to go with it. Gordon Korman has written more than 80 middle grade and teen novels since age 14, when he wrote his first book. The second book in this trilogy, Masterminds: Criminal Destiny was released in February 2016. The illustrations in this book show lots of details about hockey and ice skating. This is another one of the picture books nominated for the Ontario Library Association's Blue Spruce Award. hockey stick, Henry becomes a menace to the game—and an embarrassment to his sports-minded family. It’s not until he sees his first ice dancing performance that Henry realizes there’s something he can do on the ice that doesn’t involve boarding and body checking. Henry is ready to hang up his gear and try on some figure skates, but first he has to convince his hockey-obsessed family to let him follow his own path. 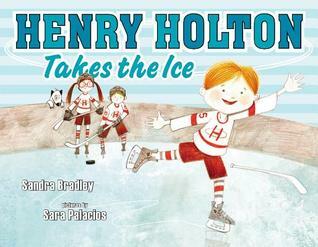 Henry Holton Takes the Ice, written by Sandra Bradley, illustrated by Sara Palacios and published by Dial Books for Young Readers in 2014. The story follows a traditional plot where the main character is different than the other people close to him, and, after trying things their way, is eventually recognized for his own unique talents. I haven’t come across many other books about boys and figure-skating, so I think that’s a real hook to pull me into this story. The illustrations are fun and contain interesting details, suggesting the illustrator spent a lot of time making observations at skating arenas! I wish there was more ethnic diversity in the scenes with groups of children on ice. I really liked the message behind the story, since it opens the door to good discussion about “boy activities” vs. “girl activities” and not being limited by gender. It was nice that Henry’s grandmother had an important role in the story. Henry’s grandmother surprised him when he found out about her past. Interview one of your older relatives to find out what sports or activities they liked to do when they were younger. What are some other activities that people think are usually mostly done by girls? Boys? Draw a picture or write a story to showing a boy or girl doing an activity that might be surprising to some people. For more great picture books, visit author Susanna Leonard Hill's original theme list of Perfect Picture Books on her blog or this theme list with links to Pinterest collections on each theme - a very helpful resource! 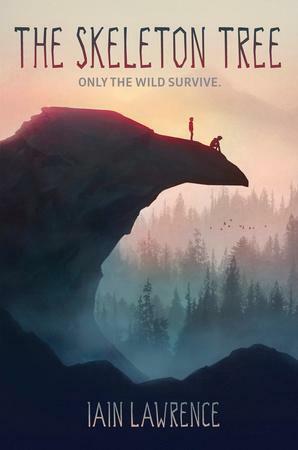 The tag line on the cover caught my attention: Only the wild survive. I’m a big fan of survival stories so when I saw this at the library, I had to sign it out. The Skeleton Tree was written by Iain Lawrence and published by Tundra Books (a division of Random House) in 2016. There’s lots of action in this story, starting from the beginning where the boys are shipwrecked. It was interesting how Frank knew more about managing in the wilderness than the main character Chris, who was actually much more likeable. Even though there was tension due to the challenges of surviving in the wilds, much of the book is actually about the relationship between the boys. I really liked the raven, Thursday, and found the slight supernatural elements related to it and the skeleton tree interesting and unique for this type of story. From a writer’s perspective, I liked the authentic details about the wilderness that the author embedded in the story. They helped to create a strong sense of place. It wasn’t always clear how much time was passing. Iain Lawrence has written 15 books for young readers. He worked in logging, fishing and as a forest fire fighter before becoming a journalist and writer. I enjoy watching birds (and am participating in Project Feeder Watch) so the title of this book captured my attention. I didn't realize it was a fable! I don't see many of those in picture book form. I found it as part of my goal to read all of the nominees for the 2016 Blue Spruce Award from the Ontario Library Association. The Cardinal and the Crow, written and illustrated by Michael Moniz, was published in 2014 by Simply Read Books. I liked the way backyard birds are featured in this story inspired by Aesop’s Fables. The theme of bullying is central to the story and the ‘moral of the story’ is stated in the text (though in sophisticated language that might need to be explained to younger students). This is a different kind of style than many picture books I’ve read, but it’s an interesting example of how retain the flavour of a traditional fable while including contemporary issues and familiar characters. Different sizes of font for dramatic moments help to add interest to the design. The large illustrations and straightforward storyline are good features for a read aloud. 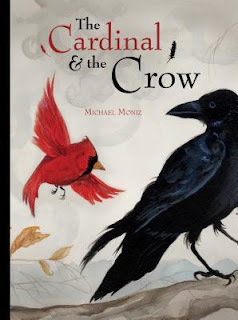 I also liked the descriptive language, which is sometimes good for students to be exposed to (and not so common with the recent trend for shorter picture books). The story in this book offers opportunities for discussions about teasing and bullying. Although this book is recommended for ages 4 – 8, I’m not sure it would hold the attention of some of the younger students in my kindergarten class, because of the wordiness and description. Discuss how the crow might be feeling at different points in the story. Why did the crow decide to help the cardinal? Create bird puppets on craft sticks and retell the story in your own words. Make a bird feeder and watch for birds coming to the feeder. How many different kinds do you notice? When I picked this up at the library, I was intrigued by the cover and title. It’s about a girl coping with the loss of her sister and the changes that creates for her family. This is another book on the short list for the 2016 Silver Birch Fiction Awards from the Ontario Library Association. Bethany knows that she is special. She doesn't learn things as easily as her classmates do and that sometimes makes them mean to her. They call her names - including the really "bad" name. Even her mom and her sister Mira say unkind things at times. But Bethany has friends like her neighbor Mrs. Goldsborough as well as happy times with Dad when he gets home from work. And now, Mira has promised to protect her from the bullies when the new school year begins. Then tragedy strikes, tearing Bethany's world apart in ways she could never have imagined, and she starts to wonder if there will ever be a place that feels like home again. Rain Shadow was written by Valerie Sherrard and published by Fitzhenry & Whiteside in Scholastic Canada in 2014. I enjoyed reading this story, though the things that happened to Bethany and her family made me feel sad. At times, I also felt angry for Bethany, and disappointed in some of the characters who treated her unkindly. One of the best things about this story is the way the relationship between Bethany and her father deepens as their family troubles intensify. Bethany is an interesting character, showing strength and a never-give-up optimism even when faced with difficult challenges. This would be a good book for classroom discussions about special needs and different ways people handle grief. From a writer’s perspective, this is a good novel to study to see how to create a first-person perspective. There are many instances where the reader has to infer what is happening based on Bethany’s thoughts and observations. Valerie Sherrard lives in New Brunswick in what once was a funeral home, with her husband and cats. This novel is a companion to her novel, The Glory Wind, with glimpses of some of the characters. The Glory Wind was nominated for a Silver Birch Award too -- in 2012. Valerie Sherrard was inspired to become a writer by her 6th grade teacher.